Jennifer is a full-time Assistant Professor of Anesthesiology for Barry University's Anesthesiology programs. She was born and raised in Michigan where she completed her BSN at Lake Superior State University in 1993. After working for five years as a critical care nurse at Henry Ford Wyandotte Hospital, she applied to nurse anesthesia school. In 2000 she received her Masters of Science Degree in Anesthesia from The University of Detroit/Mercy. Jennifer began her doctoral quest at The University of Michigan in August of 2014, and will be a candidate for The Doctor of Anesthesia Practice Degree (DrAP) in December of 2017. She spent the majority of her anesthesia career at St John Medical Center, an inner city Detroit Level one trauma center. Her areas of interest lie in trauma anesthesia, cardiovascular surgery and fatigue science. 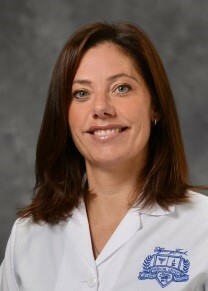 Jennifer currently works as the manager of anesthesia services for two hospitals in the Henry Ford Health System. Teaching has always been her passion, and she is very excited to embark on this new adventure with the Barry Faculty.